Colts coach Chuck Pagano has no issue with the Pats' offensive substitutions. Coach Bill Belichick was asked on Monday about the unconventional offensive substitutions that had Ravens coach John Harbaugh so incensed and he didn't seem particularly happy about the question. "I don't know what you're talking about," he said, via the Boston Herald, when asked if the league should look into the matter. I mean, that happens all the time. You come in on a punt team, ineligible guys report as eligible. They line up as guards and tackles on the punt team. The center, the center's numbers in the NFL are eligible players that report ineligible. Then they cover punts. We've seen it on offense. We see it particularly a lot on special teams, the kicking game, punting game -- not so much on the field goals because you have your linemen protecting there. "But I'd say it happens every game on the punt team. You're allowed to do that. 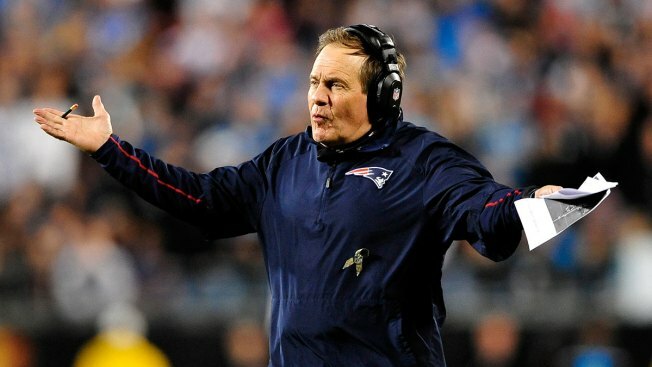 I don't really understand what the question is," Belichick said. "If you want to talk about the rules, you should talk to the NFL rules people about that. They'll tell you about it." Despite Harbaugh's protestations, Colts head coach Chuck Pagano -- who'll face the Pats this Sunday -- had a different take on the plays in question. "They only had four linemen in on those plays, had three wideouts, two tight ends and a running back and a quarterback," Pagano continued. "It made it difficult for the (Ravens') defense to get lined up, especially if you're in a man-to-man situation and you're trying to figure out who is eligible, who's not, who's on the ball, who's off the ball, all those types of things. You don't have a lot of time. Officials aren't going to slow the thing down and let you get lined up so to speak. We have to be prepared for everything obviously." It's not a bad idea, especially against the Patriots. Just ask the Ravens.